1. Lightly grease heavy oven trays and line with baking paper. Combine the ground almonds and icing sugar in a food processor and pulse briefly, then sieve twice and set aside in a bowl. 2. Process pistachios until finely ground. Sift and discard any remaining course bits, then set aside. 3. Beat eggwhites with an electric mixer until soft peaks form. Add caster sugar a teaspoon at a time along with a few drops of the colouring. Beat until the sugar dissolves and the eggwhites are thick and glossy. 4. Fold in 1/4 c of the ground pistachios and then the icing sugar and ground almonds in 2 batches. The mixture should 'flow like magma', which means it should slide slowly down the side of the bowl when you tip it. 5. Spoon mixture into a piping bag fitted with a 1 cm plain nozzle. Pipe 4cm rounds about 2cm apart onto trays. Tap trays on bench so macarons spread lightly. 6. 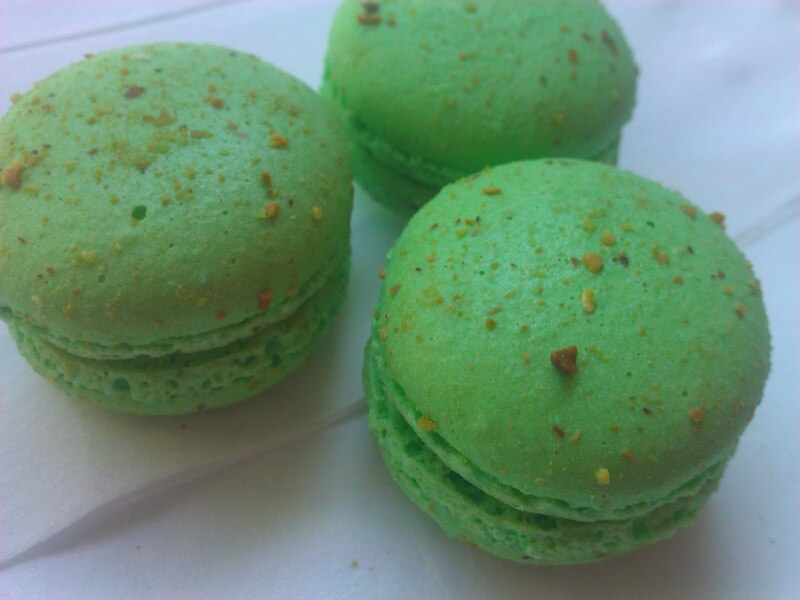 Dust macarons with extra sifted icing sugar and sprinkle with a little of the remaining grounds pistachios (as much or as little as you like). Stand 30 minutes, or until you can touch them lightly without any batter sticking to your finger. Meanwhile, preheat the oven to 150 degrees celsius. 7. Bake around 12-15 minutes. 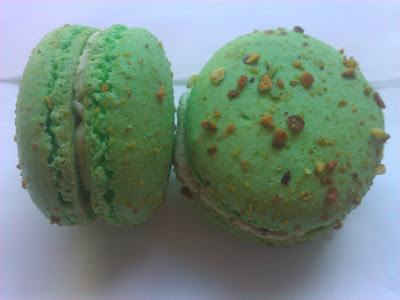 Keep an eye on the macarons and remove them before they start developing any golden colour on the edges. Cool on trays. 8. To make the filling heat the cream in a small saucepan, removing it from the heat just before it reaches boiling point. Pour the cream over the white chocolate in a small, heatproof bowl. Sit for about a minute and then stir until smooth. Sit until the ganache thickens to spreadble butter-like consistency then stir in the orange blossom water. 9. Sandwich the macarons with the filling, and enjoy! - I don't reccomend using 4 teaspoons of orange blossom water!! They turn out tasting like a plant if that much is used so maybe only 1-2 teaspoons is best. - Keep aside some extra pistachio nuts to process more roughly with your food processor to later sprinkle on top of your macaroons just before they are put in the oven. If your like me though, keep aside more than you think you should because i usually end up eating most of them before it comes time to use them. 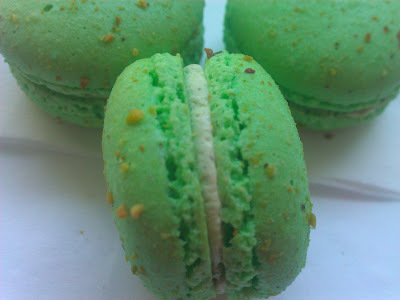 - If your a huge pistachio fan then include some finely processed (but not to the point where it is a powder) pistachios to include in your ganache. - Don't fill all of your macaroons at once unless you plan on eating 16 of them in one serve because they keep for longer when not filled. oh wow, i thought that macaroons were supposed to be really hard to make. people on masterchef make a mess of it all the time. you must be amazing at baking!